“To respect and value personal uniqueness and differences; to attract and retain diverse faculty, staff and students; to challenge stereotypes; and to promote sensitivity and inclusion” — these words are from the UT Physician Assistant Program pledge. On behalf of the Physician Assistant Education Association, Christopher Cooper presented the UT Physician Assistant Program with the 2011 Excellence Through Diversity Award, which was accepted by, from left, Dr. Vivian Moynihan, Dr. Patricia Hogue, April Gradner and Sheri Gentry. 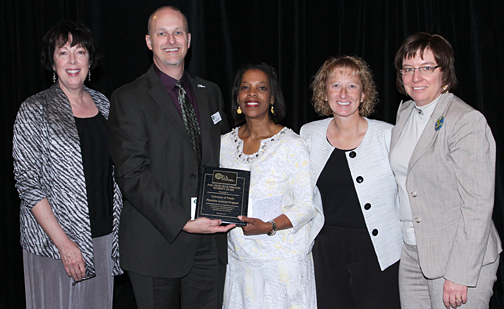 The Physician Assistant Program is the recipient of the 2011 Excellence Through Diversity Award from the national Physician Assistant Education Association. The award was presented Nov. 3 at the association’s Education Forum in New Orleans. Every year, the UT Physician Assistant Studies faculty, staff and students attend the awards luncheon, admiring the nominees for their outstanding achievements, according to Dr. Patricia Hogue, associate professor and chair of the Department of Physician Assistant Studies and assistant dean of diversity, student recruitment and retention. This year, Hogue said those involved with the program mustered up the courage to submit, along with 150 other programs, and were thrilled to learn UT was selected to receive the prestigious award. The award recognizes the outstanding commitment of a Physician Assistant Education Association member program in its implementation of specific strategies and activities designed to foster the diversity of the program faculty, staff and student body. The UT program places a major focus on diversity training for both faculty and students. The curriculum contains courses on topics that include providing care to diverse populations, the uninsured and the underinsured, cultural competency, and health-care disparities. UT has the first graduate-level physician assistant program in Ohio, and students earn a master of science in biomedical sciences. The program is designed to prepare graduates for primary care practice with emphasis placed on both service to medically underserved populations and the team approach to health-care delivery. For more information on the UT Physician Assistant Program, click here. This entry was posted on Thursday, December 8th, 2011 at 4:13 am and is filed under News, UToday .